On the narrative end, Vaporum is more than engaging enough. Surprisingly well-performed audio logs litter the halls, telling the story of our clockwork tower. On the visual side, the halls are dimly lit and filled with clunking robots and steam spouting pipes. Nothing revolutionary, but it's a pretty good steampunk fantasy world. Old and new merge in Vaporum: the result is an engaging game able to satisfy basically everyone. Vaporum slaps a fun Steampunk skin on an old-school grid-based dungeon crawler, and the results are engaging and fun. With plenty of customization for players to dig into, numerous puzzles to solve, and winning real-time (but pause-able) combat, Vaporum hums along on all cylinders. Thought the overly complex control system could be substantially streamlined, the charms of the game overcome the struggle to control it. Vaporum offers a very engaging blend of dungeon crawling, RPG and survival games that it's hard to put down until the end of the campaign. While the mechanics may not be all that original, the customization possibilities, exploration, and puzzles make it so that players won't be troubled by the relative lack of innovation. Old-school dungeon crawling with a few modern-day touches, Vaporum attention to detail is wrapped around a tale of steampunk mystery and some fresh ideas. A solid outing by Fatbot Games for an oft-overlooked genre, Vaporum is one I can recommend, but not without caveats. If you weren't a fan of the genre before, this is unlikely to make you a believer. If you enjoy real-time pause-based systems or are simply looking to approach something new with an open mind, however, it might be worth giving Vaporum a chance. 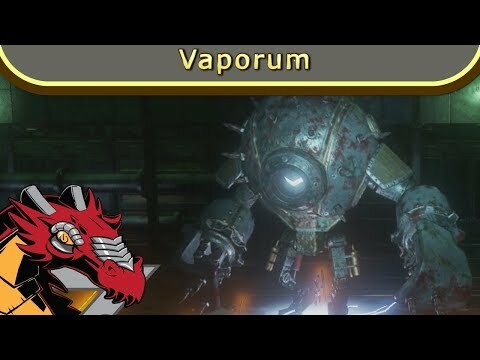 If you’re a steampunk aficionado then Vaporum will doubtless hold some appeal for you; it’s smartly presented and tells a tantalisingly haunting tale of man’s folly. But for those who aren’t as taken with steam power, Vaporum is a rather average dungeon crawler. Vaporum is a throwback to an old-school genre, but it doesn't bring about a renaissance for the grid-based dungeon crawler on console. It's a fairly by-the-numbers dungeon crawl that borrows the Steampunk aesthetic, and offers some genuinely clever twists, as far as combat goes. There aren't too many dungeon crawlers on the Switch, and even within that category Vaporum is flat enough that it doesn't come out on top, but it's a pleasurable way to bust a few hours on a weekend nonetheless. Vaporum is full of steam, iron spiders and puzzles to solve. It can be a very entertaining title for Dungeon Crawling RPG fans. If you like Legends of Grimrock 1&2, do not hesitate,Vaporum is the game for you! After all it's not a perfect game, but have in mind it's been made by an indie studio and has considerable play-time. If Vaporum was more optimized for consoles then it would have been a must-play dungeon crawler. The most impressive aspect of the game goes beyond its effective console port. The game is “small” in the indie sense, not made by hundreds but by a core team of four developers. Nevertheless, the game's graphical presentation, attention to detail, and handcrafted design are all so instantly appealing that plenty of AAA gamers who give it a go will surely find themselves hooked. Also, definitely tell that friend who likes BioShock that another kick of spooky, clanking, clockwork mystery is available to jump into. Overall, Vaporum is a wonderful homage to an age when games weren’t all Fortnite and memes. Approached with calm and an open mind, Vaporum is stimulating and inspiring, and may make you like dungeon crawlers more. Vaporum has around 15 hours worth of gameplay to conquer and many secrets to discover. Will you solve the mystery of the tower and get out alive? or will you succumb to the monsters that lie in wait for you? Having played Dungeon Master when I was young lad along with gems such as Bloodwych, Eye of the Beholder, heck even the original Doom, I love grid-based dungeon crawlers. Playing Vaporum brought back the nostalgia and to have it in a gothic steampunk setting really made this game something special for me. Breaking from the shackles of PC and launching onto multiple platforms, Vaporum brings back the genre both immersively and beautifully. Vaporum earns the prestigious Thumb Culture Platinum Award! Vaporum is a great throwback to the days of classic dungeon crawlers. The game is full of puzzles, exploration and a wonderful narrative all wrapped in some nice, basic RPG elements. If you're buying this Switch version purely to go mobile then be forewarned that it might induce eye strain, otherwise, it's a strong buy! Vaporum is an impressively authentic homage to a bygone era, but at a cost. Part of me wonders what this game could have been like if it were a regular first-person shooter and not grid based. The game was good, but it seems like there is a lot more that could have been. I was let down by the lack of steampunk elements and how most of the unique and interesting parts didn't happen until the second half of the game, but It didn't take away from the fun of the puzzle solving. This game has some good puzzles and it is a lot of fun trying to figure them out. The diverse enemy types and combat make the RPG elements of the game more interesting and make you put some thought into the gear you equip. A story with voice acting is a real plus when it comes to indie games and this really helps bring the Vaporum to life and give a good sense of what went on in this place before your arrival. I would like to see another entry to this series in the future. Fumium has the potential for a lot more and It would be great to see another game around this in the future. If you like dungeon crawlers, then this game is definitely worth picking up.